Fulke Greville, 1st Baron Brooke, English poet, the only son of Sir Fulke Greville, was born at Beauchamp Court, Warwickshire. He was sent in 1564, on the same day as his lifelong friend, Philip Sidney, to Shrewsbury school. He matriculated at Jesus College, Cambridge, in 1568. 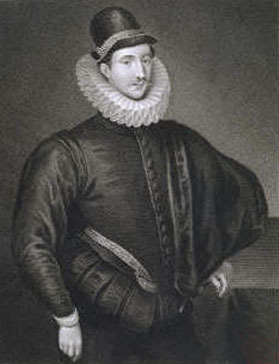 Sir Henry Sidney, president of Wales, gave him in 1576 a post connected with the court of the Marches, but he resigned it in 1577 to go to court with Philip Sidney. Young Greville became a great favorite with Queen Elizabeth I, who treated him with less than her usual caprice, but he was more than once disgraced for leaving the country against her wishes. Philip Sidney, Sir Edward Dyer and Greville were members of the "Areopagus", the literary clique which, under the leadership of Gabriel Harvey, supported the introduction of classical metres into English verse. Sidney and Greville arranged to sail with Sir Francis Drake in 1585 in his expedition against the Spanish West Indies, but Elizabeth peremptorily forbade Drake to take them with him, and also refused Greville's request to be allowed to join Leicester's army in the Netherlands. Philip Sidney, who took part in the campaign, was killed on the 17th of October 1586, and Greville shared with Dyer the legacy of his books, while in his Life of the Renowned Sir Philip Sidney he raised an enduring monument to his friend's memory. About 1591 Greville served for a short time in Normandy under Henry of Navarre. This was his last experience of war. In 1583 he became secretary to the principality of Wales, and he represented Warwickshire in parliament in 1592-93, 1597, 1601 and 1620. In 1598 he was made treasurer of the navy, and he retained the office through the early years of the reign of King James I. In 1614 he became chancellor and under-treasurer of the exchequer, and throughout the reign he was a valued supporter of the king's party, although in 1615 he advocated the summoning of a parliament. In 1618 he became commissioner of the treasury, and in 1621 he was raised to the peerage with the title of Baron Brooke, a title which had belonged to the family of his paternal grandmother, Elizabeth Willoughby. He received from James I the grant of Warwick Castle, in the restoration of which he is said to have spent £20,000. He died on the 30th of September 1628 in consequence of a wound inflicted by a servant who was disappointed at not being named in his master's will. Brooke was buried in St. Mary's church, Warwick, and on his tomb was inscribed the epitaph he had composed for himself: "Folk Grevill Servant to Queene Elizabeth Conceller to King James Frend to Sir Philip Sidney. Trophaeum Peccati." A rhyming elegy on Brooke, published in Huth's Inedited Poetical Miscellanies, brings charges of extreme penuriousness against him, but of his generous treatment of contemporary writers there is abundant testimony. His only works published during his lifetime were four poems, one of which is the elegy on Sidney which appeared in The Phoenix Nest (1593), and the Tragedy of Mustapha. A volume of his works appeared in 1633, another of Remains in 1670, and his biography of Sidney in 1652. He wrote two tragedies on the Senecan model, Alaham and Mustapha. The scene of Alaham is laid in Ormuz. The development of the piece fully bears out the gloom of the prologue, in which the ghost of a former king of Ormuz reveals the magnitude of the curse about to descend on the doomed family. The theme of Mustapha is borrowed from Madeleine de Scudérys Ibrahim ou l'illustre Basso, and turns on the ambition of the sultana Rossa. The choruses of these plays are really philosophical dissertations, and the connection with the rest of the drama is often very slight. In Mustapha, for instance, the third chorus is a dialogue between Time and Eternity, while the fifth consists of an invective against the evils of superstition, followed by a chorus of priests that does nothing to dispel the impression of skepticism contained in the first part. He tells us himself that the tragedies were not intended for the stage. Charles Lamb says they should rather be called political treatises. Of Brooke Lamb says, "He is nine parts Machiavel and Tacitus, for one of Sophocles and Seneca... Whether we look into his plays or his most passionate love-poems, we shall find all frozen and made rigid with intellect." He goes on to speak of the obscurity of expression that runs through all Brooke's poetry, an obscurity which is, however, due more to the intensity and subtlety of the thought than to any lack of mere verbal lucidity. It is by his biography of Sidney that Fulke Greville is best known. The full title expresses the scope of the work. It runs: The Life of the Renowned Sr. Philip Sidney. With the true Interest of England as it then stood in relation to all Forrain Princes: And particularly for suppressing the power of Spain Stated by Him: His principall Actions, Counsels, Designes, and Death. Together with a short account of the Maximes and Policies used by Queen Elizabeth in her Government. He includes some autobiographical matter in what amounts to a treatise on government. He had intended to write a history of England under the Tudors, but Robert Cecil refused him access to the necessary state papers. Brooke left no sons, and his barony passed to his cousin, Robert Greville (c. 1608-1643), who thus became 2nd Lord Brooke. This nobleman was imprisoned by King Charles I at York in 1639 for refusing to take the oath to fight for the king, and soon became an active member of the parliamentary party; taking part in the Civil War be defeated the Royalists in a skirmish at Kineton in August 1642. He was soon given a command in the midland counties, and having seized Lichfield he was killed there on the 2nd of March 1643. Brooke, who is eulogized as a friend of toleration by John Milton, wrote on philosophical, theological and current political topics. In 1746 his descendant, Francis Greville, the 8th baron (1719-1773), was created Earl of Warwick, a title still in his family. Dr. A. B. Grosart edited the complete works of Fulke Greville for the Fuller Worthies Library in 1870, and made a small selection, published in the Elizabethan Library (1894). Besides the works above mentioned, the volumes include Poems of Monarchy, A Treatise of Religion, A Treatie of Humane Learning, An Inquisition upon Fame and Honour, A Treatie of Warres, Caelica in CX Sonnets, a collection of lyrics in various forms, a letter to an "Honourable Lady", a letter to Grevill Varney in France, and a short speech delivered on behalf of Francis Bacon, some minor poems, and an introduction including some of the author's letters.